Every year at Christmas time, when I was a little girl, we would meet up with all of my cousins at Disney World. Space Mountain, It’s A Small World, Pirates of the Carribean, the Carousel of Progress, the Wedway People Mover, and Frozen Chocolate Covered Bananas were just some of the highlights! Friends of our came over with their kids today and I thought that these bananas would be the perfect treat! And they were. Chocolate everywhere! Peel and cut the bananas in half. Insert the fork into the banana. Chop up a handful of peanuts and 3 or 4 cookies. 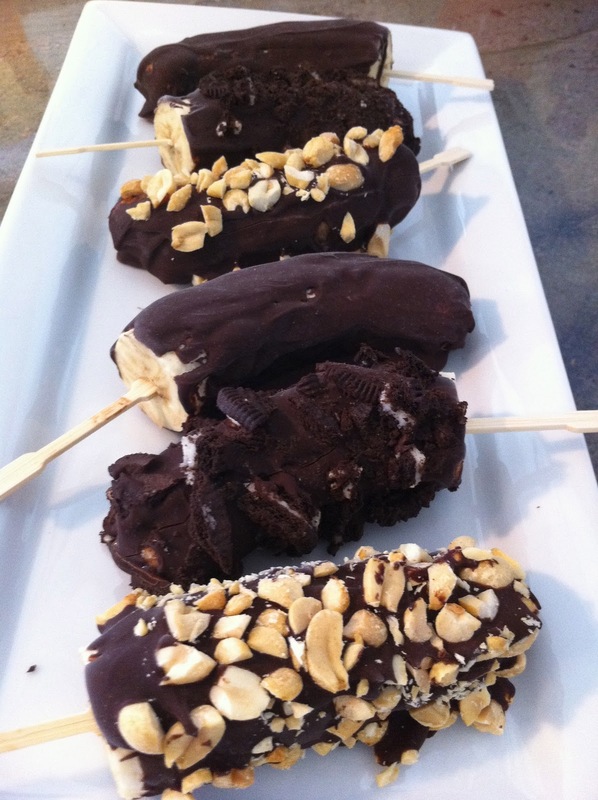 Holding the banana upside down by the stick, drip the chocolate onto the banana and spread it around, covering it. Dip it into the topping of choice. Lay the bananas on the sheet and freeze overnight.